Bahrain has extended its contract to host the FIA Formula One World Championship and stage the Bahrain Grand Prix until 2016 following the renewal of its contract with the sport’s promoter. The event has attracted sport professionals, corporates as well as families. 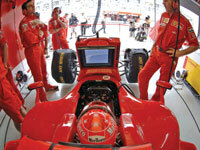 “The Bahrain F1 championship is now a major family attraction. Even schools in Bahrain are cooperating to ensure that children are not in schools that day,” said Whitaker. With Abu Dhabi unveiling its plans for its debut race in November 2009, Whitaker is confident that they can support each other. “Bernie Ecclestone had said primary considerations when allowing two races in the Middle East was to make sure that they work together for the benefit for each other. And there is no doubt that the race in Abu Dhabi will increase the fan base in the region. And when that happens, that’s good news for us. Together, we can increase the profile of regional motorsport, ” said Whitaker.